STOCKHOLM, Sweden — Six years ago, almost to the day, the tiny village of Russnäs (population 90) in Sweden was bustling. 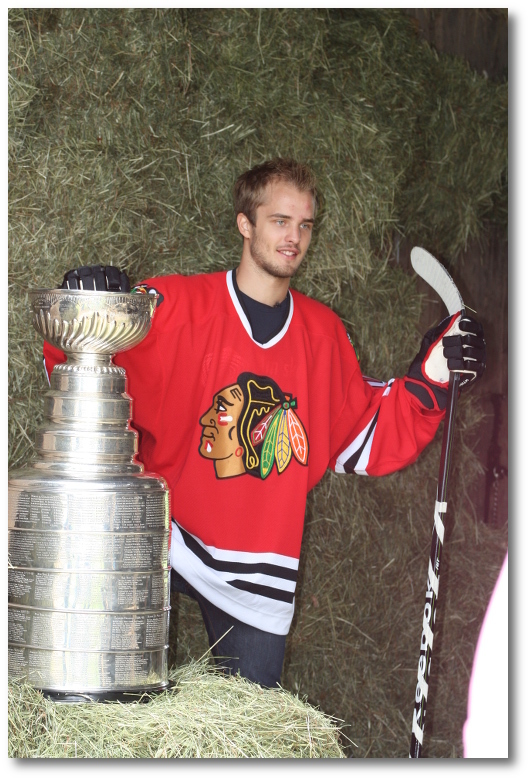 Right at the intersection off the main road that leads to the big road that takes you to the highway, under the sign that welcomes visitors to the village, there was a big photo of Niklas Hjalmarsson in his Chicago Blackhawks jersey, with a message to the young man. “Congratulations, Stanley Cup champion” it said in Swedish. Next to it, there was a tin-foil replica of the Cup. The then-23-year-old defenseman had spent most of his two previous seasons in the AHL but had taken a permanent spot in the Blackhawks’ lineup that season. He addressed the villagers (and thousands of other fans) next to the playground where he had played as a kid, standing next to bales of hay and the Stanley Cup, his voice hoarse from a fun night with his family and friends. Six years doesn’t sound like much time, but for the Hjalmarsson who met with the media at Team Sweden’s pre-World Cup of Hockey event here recently, the six years has been life-altering. Over the last six seasons, the defenseman has become a mainstay in the Blackhawks’ defense, one of the players in the team’s core group GM Stan Bowman has built the championship teams around. Only seven players in Blackhawks history have won three Stanley Cups — Jonathan Toews, Patrick Kane, Duncan Keith, Patrick Sharp, Marian Hossa, Brent Seabrook and Hjalmarsson — and Sharp is no longer with the team. Nothing brings teammates together like winning. Maybe it’s because only they know all the work and effort they’ve put into it, and the struggles they’ve gone through to make it happen. Hjalmarsson isn’t one to reflect on his Stanley Cup wins too much, at least not before he turns 35, and communicating what it takes to go all the way in the Stanley Cup playoffs isn’t easy. For anyone. “I think [of all the non-players], my parents understand it best because they’ve seen all the hard work I’ve had to put in,” he said. “The toughest part of winning is the mental side of it, grinding through a long regular season and … then 20-plus-game postseason on top of it, through injuries and everything. All 23 players on Team Sweden’s World Cup roster are NHL players, accustomed to the North American style of hockey and everything that comes with it. But coach Rikard Gronborg, 48, is a federation veteran, having started as a scout with the World Junior team in 2006, and then worked as assistant and head coach with the under-18, under-20 and men’s national teams. However, he did spend more than 10 years in U.S. colleges as a player and coach in the 1990s and is considered well-versed in North American hockey. “He seems to have the right mindset, which makes it easier for us [players] to adapt,” said Hjalmarsson, who was on the 2014 Olympic team that lost in the gold-medal final to Canada. In the upcoming World Cup, Team Sweden hopes Hjalmarsson — who is one of the core players in an impressive defense corps — can bring some of that Blackhawks leadership and winning attitude with him. Sweden has never won the World Cup of Hockey, including its Canada Cup roots. “That’s a great motivator. It’s wonderful to play for my country and to get to know the guys on this team a little better. They seem to be pretty great guys outside the rink,” Hjalmarsson said with a laugh. That’s one of the things Hjalmarsson “definitely” hasn’t done since. But winning? That never gets old. This entry was posted in Hockey, Story archives by Risto. Bookmark the permalink.